The eight-week Holiday Market on Bidwell, presented by the Elmwood Village Farmers Market, continues from 9 a.m. to 1 p.m. Saturday, Jan. 6, inside St. John’s Grace Episcopal Church, 51 Colonial Circle, Buffalo, just steps away from the outdoor market’s location at Elmwood Avenue and Bidwell Parkway. The market will continue every Saturday through Jan. 13. The Holiday Market features approximately 20 vendors, including local farmers, food producers and artisans offering a wide variety of products. Vendors scheduled to participate each week include Alpine Made, Barrel & Brine, Biscotti for Everybotti, BreadHive Worker Coop, Butter Block, Carla’s Crumby Creations, Darling Bee, Fetch Dog Treats, Kindred Kreek, Lilly Belle Meads, Native Offerings Farm, Niagara Mushrooms, Plato Dale Farm, Rooted Locally, Victorianbourg Wine Estate and Whimsy Confections. 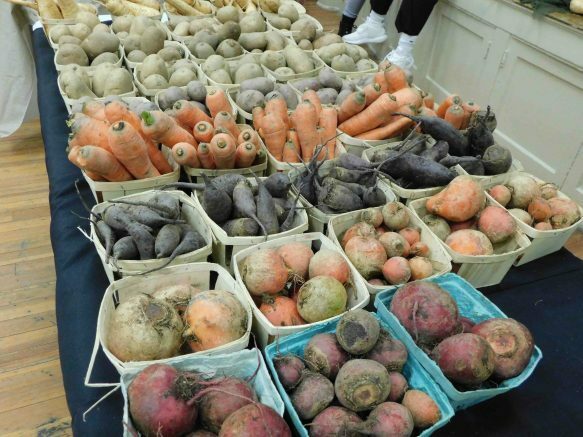 Field & Fork Network’s “Double Up Food Bucks” program continues at the Holiday Market. The program provides low-income individuals who receive Supplemental Nutrition Assistance Program (SNAP) benefits with a $1 for $1 match, up to $20, to purchase fresh, locally-grown fruits and vegetables. Please visit the market for details. Be the first to comment on "Holiday Market on Bidwell continues on January 6"